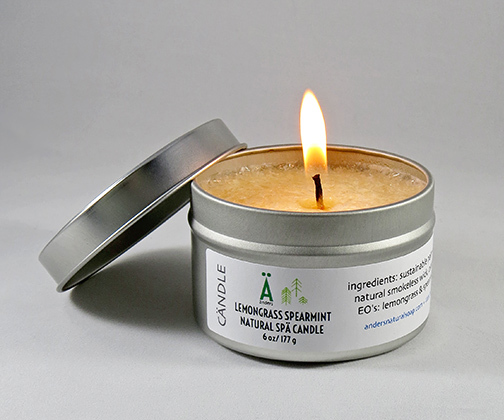 Our Lemongrass Spearmint Spa Candle is a very fresh blend. The Lemongrass and Spearmint are a perfect pair for this great candle. We formulated all of our “Spa Cändles” using only therapeutic grade organic essential oils. We formulate these candles with natural sustainable palm wax that creates a long burning candle (around 25 hours). We also use smokeless German wicks that create a very high end product. The candles are poured into (6) ounce travel tins with a rectangular label attached. Palm waxes have continued to grow in popularity over the years as "natural" waxes are more in demand than they once were. Our Palm wax is an environmentally friendly product since it comes from a sustainable and renewable source and it burns cleanly. The palm wax that we source come from a RSPO (Roundtable on Sustainable Palm Oil) member source. They do not contain any GMO material. Spearmint essential oil is steam distilled from the fresh flowers of the spearmint plant. It is not as sharp or intense as Peppermint, as it has a very low content of Menthol. It has a light refreshing scent. Light candle and allow wax to melt to all sides of tin prior to extinguishing. This will allow for cleaner subsequent burns. Candle should last approximately (25) hours.